Tentative Agreement Reached with Safeway-Sobeys! We are pleased to announce that the Safeway Negotiating Committee reached a tentative agreement with the company at 11:00pm on Thursday, February 12th, 2015. The negotiation process is rarely easy and it has been a long ten months for Safeway members as we sought to work with a new employer on reaching a fair deal. We would like to thank the members along with the members of the negotiating committee for their patience and perseverance during this period. Together, we have been able to weather the storm and come out the other side stronger than ever. Voting on the tentative agreement will take place in the first two weeks of March. Posters with the locations, dates, and times of the meetings and votes will be posted in stores once the venues have been finalized. These posters will go up no later than Friday, February 20th, 2015. Additionally, we will be posting the tentative agreement on which you will be voting, on our new website by Thursday, February 26th, 2015. It is extremely important that all Safeway members come out to vote as this is your contract so please make your vote count!!!! The meetings will provide an opportunity for your Union Representatives and members of the negotiating committee to go over every aspect of its contents with you in detail. 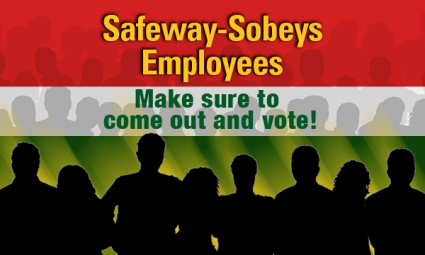 Union Representatives and negotiating committee members will be available to Safeway members throughout the meeting days to discuss the tentative agreement and answer questions so you can make an informed vote. Thank you again to Safeway members for their patience and strength throughout this process. We look forward to seeing you at the meetings and votes. UPDATE: Dates have now been set for Safeway Ratification meetings and votes to take place in the first two weeks of March. Province wide dates and locations can be found below. Explanation Meetings will be held at 10:00 a.m. and 6:30 p.m., voting will be from 10:00 a.m. to 8:00 p.m. You may vote at any of the locations listed below. Holiday Inn Express 9 Strachan Bay S.E. Glenmore Inn 2720 Glenmore Trail S.E.